Mouse monoclonal Mast Cell Tryptase antibody [AA1]. Validated in WB, ELISA, IHC, ICC, ICC/IF and tested in Mouse, Rat, Human. Cited in 38 publication(s). Independently reviewed in 32 review(s). This antibody reacts with mast cells distributed in skin, synovium, lung and heart. It does not bind with any other cell type. Recognises human mast cell tryptase, both alpha and beta isoforms. WB: Human lung, tonsil and skin tissue lysate. Our Abpromise guarantee covers the use of ab2378 in the following tested applications. WB Use a concentration of 1 - 5 µg/ml. Detects a band of approximately 35-37 kDa (predicted molecular weight: 31 kDa). We recommend using 3% milk as the blocking agent for Western blot. 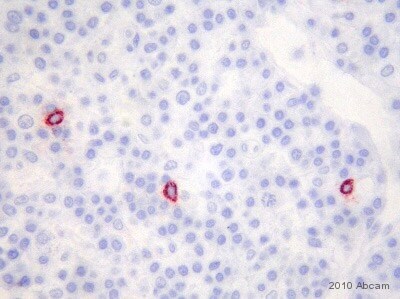 IHC-P Use a concentration of 0.1 µg/ml. IHC-R Use at an assay dependent concentration. Mast cells contain a number of preformed chemical mediators such as histamine, chymase, carboxypeptidase and proteolytic tryptase. Human Mast Cell Tryptase is considered to be an important marker of mast cell activation as well as an important mediator of inflammation. Secreted. Note: released from the secretory granules upon mast cell activation. 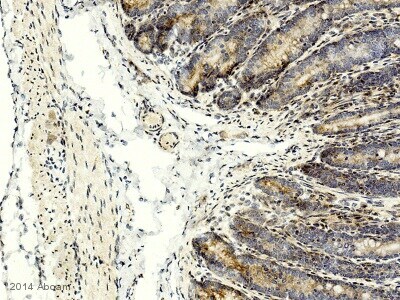 Immunohistochemistry (Formalin/PFA-fixed paraffin-embedded sections) - Anti-Mast Cell Tryptase antibody [AA1] (ab2378)Meyer at al PLoS One. 2013;8(2):e56773. doi: 10.1371/journal.pone.0056773. Epub 2013 Feb 22. Fig 2. Skin biopsy in CUrt patient stained for tryptase (ab2378, red) at baseline at low (10×, upper panels) and high (60×, lower panels) magnification and at 15 minutes following cold stimulation time test. Skin biopsies were obtained at baseline and 15 minutes after CSTT (5 min) on the challenge site, placed into 10% neutral buffered formalin, embedded in paraffin and cut into 5-µm-thick sections. Local anesthesia was performed just before biopsy and did not delay the timing of the biopsy. Slides for immunohistochemistry were deparaffinized and stained. ab2378 was diluted 1∶100 and incubated for 2 hours. A biotinylated undiluted secondary antibody of Goat anti-Mouse SS Link, was incubated for 32 minutes, followed with enzyme conjugate, and Fast Red chromogen. Immunohistochemistry (Formalin/PFA-fixed paraffin-embedded sections) - Anti-Mast Cell Tryptase antibody [AA1] (ab2378)De Martin et al PLoS One. 2014 May 15;9(5):e97592. doi: 10.1371/journal.pone.0097592. eCollection 2014. Fig 2. 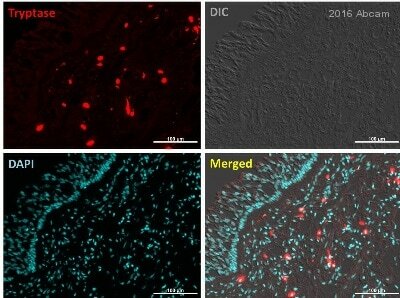 AM distribution in thymic mast cells in cryostat sections of human newborn thymic tissue. Sections were incubated with an antibody against tryptase (A, B) using ab2378 at a 1/100 dilution. 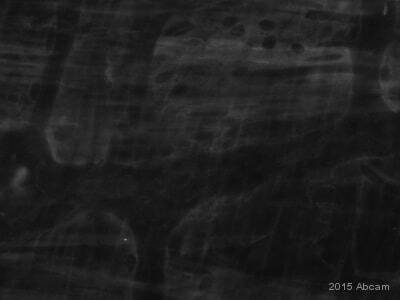 Briefly, frozen sections (10 µm-thick) were cut with a cryostat at −20°C. Antigens were retrieved by heating the sections previously immersed in Bond Epitope Retrieval solution 1 at 100°C for 30 min. Sections were washed in phosphate buffered saline (PBS) and incubated with the primary antibody. ab2378 staining Mast Cell Tryptase in rat Lung tissue sections by Immunohistochemistry (IHC-P - paraformaldehyde-fixed, paraffin-embedded sections). Tissue was fixed with formaldehyde and antigen retrieval was by heat mediation in a citrate buffer. Samples were incubated with primary antibody (1/200) for 16 hours at 4°C. A Biotin-conjugated Goat anti-mouse IgG polyclonal (1/500) was used as the secondary antibody. 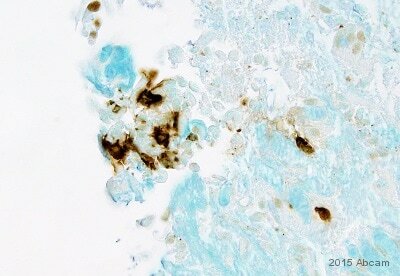 ab2378 staining Mast Cell Tryptase in human tonsil tissue sections by Immunohistochemistry (IHC-P - paraformaldehyde-fixed, paraffin-embedded sections). Tissue was fixed with formaldehyde and blocked with 1% BSA for 10 minutes at 21°C; antigen retrieval was by heat mediation in a citric acid. Samples were incubated with primary antibody (1/7500 in TBS/BSA/azide) for 2 hours at 21°C. A Biotin-conjugated Goat anti-mouse IgG polyclonal (1/250) was used as the secondary antibody. ab2378 staining Mast Cell Tryptase in mouse Lung (LPS inflammation) tissue sections by Immunohistochemistry (IHC-P - paraformaldehyde-fixed, paraffin-embedded sections). Tissue was fixed with paraformaldehyde and blocked with 4% M.O.M Ig blocking for 1 hour at 20°C; antigen retrieval was by heat mediation in a citric acid. Samples were incubated with primary antibody (1/200 in blocking buffer) for 16 hours at 4°C. A Biotin-conjugated Rabbit anti-mouse IgG polyclonal (1/100) was used as the secondary antibody. Mast Cell Tryptase contains an 18-residue signal sequence and a 12-residue activation peptide. The protein also has two potential glycosylation sites (Swissprot data). These post-translational modifications might explain the banding pattern observed. Abcam used 5% milk in TBS-T as a blocking agent for this blot. We found that this blocking agent removed more non-specific bands than BSA. 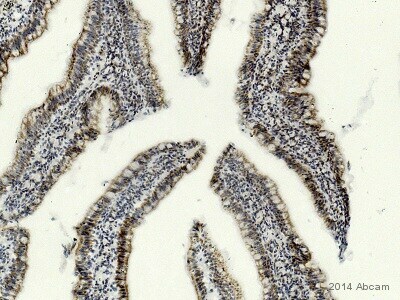 ab2378 staining Mast Cell Tryptase in human nasal polyp and tonsil tissue sections by Immunohistochemistry (resin-embedded sections). Tissue was fixed with acetone and inhibitors and embedded in GMA resin. Samples were incubated with primary antibody (1/2000 in Tris buffered saline) for 18 hours at 21°C. A Biotin-conjugated Rabbit anti-mouse IgG polyclonal (1/1000) was used as the secondary antibody. 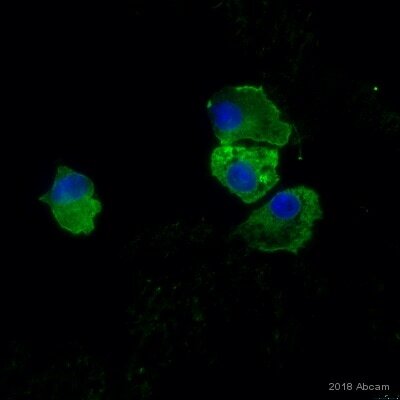 ab2378 staining Mast Cell Tryptase in RAW 264.7 (Mouse macrophage cell line transformed with Abelson murine leukemia virus) cells by ICC/IF (Immunocytochemistry/immunofluorescence). Cells were fixed with paraformaldehyde, permeabilized with 0.1% Triton X-100 and blocked with 10% Super block for 1 hour at 22°C. Samples were incubated with primary antibody (1/150 in PBS + 10% super block) for 14 hours at 4°C. An Alexa Fluor® 568-conjugated Goat anti-mouse IgG polyclonal (1/500) was used as the secondary antibody. 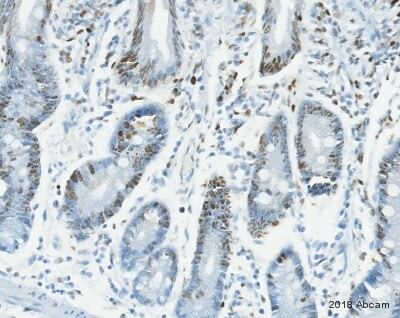 ab2378 staining formalin fixed paraffin-embedded human colon tissue sections cut at 1 micron. The section was subjected to heat mediated antigen retrieval and permeabilized in Triton-X prior to blocking in 6% BSA for 2 hours at 24°C. The primary anitbody was diluted 1/250 and incubated with the sample for 16 hours at 5°C. The secondary antibody was ab7064 (diluted 1/2000) and the slide was counterstained with DAPI. ab2378 staining Mast Cell Tryptase in human mast cells by ICC/IF (Immunocytochemistry/immunofluorescence). Cells were fixed with methanol, permeabilized with Saponin 0.1% in PBS and blocked with 4% serum for 30 minutes at 25°C. Samples were incubated with primary antibody (1/100 in blocking buffer) for 14 hours at 4°C. A Texas Red® conjugated Goat anti-mouse polyclonal (1/100) was used as the secondary antibody. Publishing research using ab2378? Please let us know so that we can cite the reference in this datasheet.